Have you seen our all new, all natural Dark Chocolate Active Manuka Honey Mints that can help boost your digestive tracts in a tasty way? 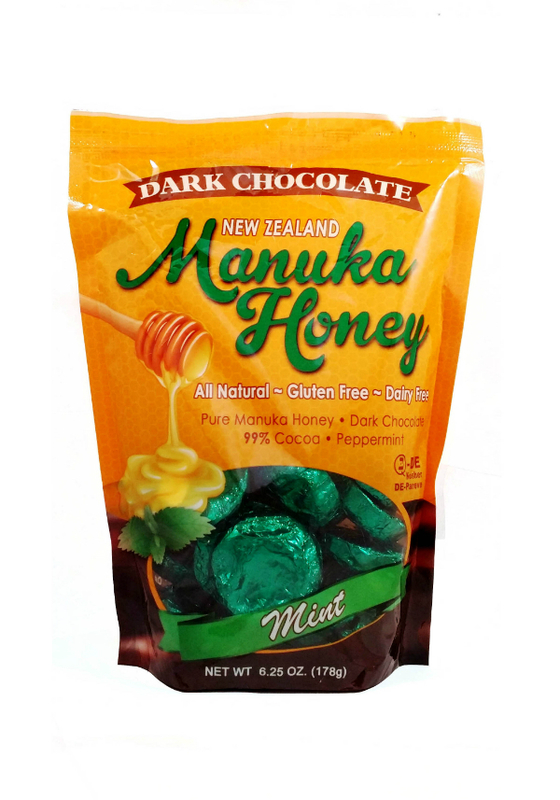 Our delicious but still good for your dark chocolate manuka honey mints. We are showcasing the Dark Chocolate Active Manuka Mints at upcoming shows, Natural Product Expo West and Fancy Food Show in San Francisco. Our award winning chocolates are made by wrapping dark chocolate around the finest New Zealand Manuka Honey tested 5+ and adding a little mint. PRI’s Active Manuka Honey Mints contain only 3 Ingredients: Pure Manuka Honey, Dark Chocolate-99% Cocoa, and Oil of Peppermint. They are All Natural, Gluten Free, Dairy Free and Kosher with no use of artificial colors, flavors, or preservatives. Best of all they are produced right here in the USA. It is that simple and they are that good for you.